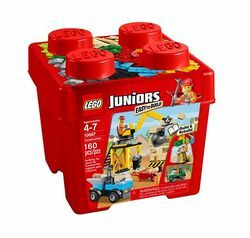 10667 Construction is a Juniors set released in 2014. This is a description taken from LEGO.com. Please do not modify it. (visit this item's product page) Knock down the wall and rebuild it on the construction site! Grab your hard hat and head onto the construction site. 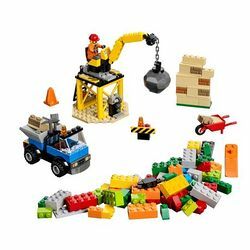 Use the crane and wrecking ball to knock down the wall, load the bricks into the Easy to Build construction truck with the wheelbarrow and drive them away. Then use the scaffolding to rebuild the wall…and it’s a job well done! This iconic starter set comes in a distinctive, reusable storage box and has instructions so that you can rebuild it into 2 new models. It’s the ideal way to challenge your child’s building skills and let them learn to build with LEGO bricks. It makes a great gift, too. Includes a construction worker minifigure. Knock down the wall and rebuild it on the construction site!